Well, what do you know! I’m a VCP… 5! Back in December 2011 I have passed my VCP4 exams and was trying to avoid taking classroom training by passing VCP5 before end of Feb 2012. Guess what – it didn’t happen! Last week on Tue-Wed I was sitting in a classroom for two days (hurray not!) following VMware vSphere: What’s New [V5.0] course objectives. Not great already knowing what’s new in vSphere 5 but it had to be done. For me this was the only prerequisite needed before taking my exam and being officially certified on version 5. Fast forward few days and today I have passed my VCP5 certification with rather respectable score (again!) Very pleased with that. 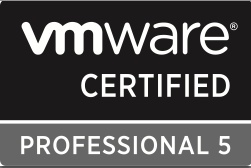 I’m now a double VMware Certified Professional – already on version 4 and now on version 5. Exam itself wasn’t too much different from VCP4 really, in fact I do recall some questions from previews exam but in tweaked form i.e. vSphere 4.x became 5.x but the question was exactly the same etc. There is no restrictions in place for not allowing you to take both exams and be certified on both VCAP’s – its perfectly fine to have both certifications. For me though its all about VCAP5-DCA for the time being and I shall carry on the momentum of studying from my recently passed VCP5! What I really like about the VCAP exams is that they are 100% practical exams. No more ridiculous configuration maximums or other meaningless numbers – VCAP is all about pure practice and experience. Examples of problems to solve – vMotion is broken and VMs aren’t migrating between host A and B, go fix it. I can’t wait to sit the exam! This entry was posted in General, VMware and tagged certification, exam, VCAP5-DCA, VCAP5-DCD, vcp4, vcp5, VMware on October 16, 2012 by Adrian Kielbowicz. Well, what do you know! I’m a VCP… 4! That’s right, you’re reading this correctly – I managed to pass my VCP-410 certification exam about a week ago with a very respectable score! Very pleased with myself to be honest. Exam itself was a bit on the hard side due to me not having all the kit to play with – you can read this primarily as a FC SAN and all that goes with it I suppose. In order to properly prepare I had to take a week off from work but it was well worth it. I mean not like I had to study from scratch, it was more of a revision week rather than learning the product from ground up which always helps. Another stressing factor during the exam was the dreadful clock ticking against me, 85 questions in 90 minutes is pretty tight, 1 minute and few seconds to read the question, understand it, read all the answers and eliminate the less obvious ones is TIGHT. 5-10% of questions had only 1 answer, rest had either 2 or 3 possible answers. Questions were constructed in a very crafty way (some of them at least) so had to be on top of my game in order to don’t be caught “clicking too fast”. Now that VCP-510 is out and if you take, and pass, the exam before end of Feb 2012 there is no need to take any classroom training. As I’m on VCP-410 already I would have to take the VMware vSphere: What’s New [V5.0] course, if I wasn’t then its start from scratch by taking the VMware vSphere: Install, Configure, Manage [V5.0]. Not that I mind but as I, most likely, would end up paying from my own pocket – every little counts! So the plan is to try to pass the VCP-510 before end of Feb and studying shall commence asap. Wish me luck then as I’m going to need it to upgrade to VCP-510! This entry was posted in General, VMware and tagged exam, vcp, vcp4, VMware, vmware certified professional on December 24, 2011 by Adrian Kielbowicz.